The Fawcett Society [on 20th October] gave an initial response to the Comprehensive Spending Review. “The £18bn a year cuts to the welfare budget, as outlined today and in the recent emergency budget will also see women bear the brunt as benefits typically make up one fifth of women’s income as opposed to one tenth of men’s. Taking Housing Benefit as just one example – a million more women claim this than men, and many of these will be lone parents facing poverty. “Rolling back public services hits women particularly hard not only because they tend to use services more frequently and more intensively then men, but also because of their sizeable caring responsibilities. Slashing at this aspect of the welfare state does more than reduce the support many women rely on, it also increases the burden they carry – many women with caring responsibilities for children and elderly relatives will find it harder to manage as the help they’ve thus far relied on dries up. “The measures unveiled today seem, as is becoming a theme of the Coalition Government, to see women’s services and benefits as a soft target. But women aren’t starting on an equal footing – women typically earn and own less than men, and are more likely to live in poverty. They do not have the same independence and financial security that men do, and they are under-represented in boardrooms, in politics and in public life generally. Making women bear the brunt of deficit cutting measures makes a mockery of the government’s claimed commitment to fairness. There was a public meeting in Honiton on Saturday (26th June 2010) at the Royal British Legion and I managed to pop along for part of it. 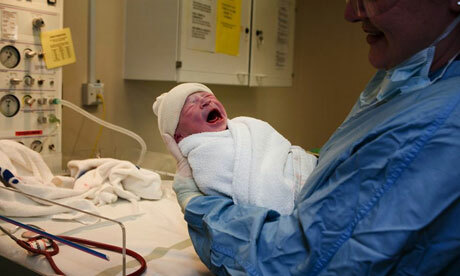 It is part of a series of consultation exercises so the NHS (Royal Devon & Exeter NHS Foundation Trust) can listen to the views of people in the area – concerning the proposed changes to maternity provision at Honiton, Okehampton and Tiverton. Unfortunately – I don’t think anyone attending the meeting really felt that the panel of three NHS representatives were really listening to anyone, except themselves! Their initial presentation was supposed to take just 5 – 10 minutes and went on for about 20 mins, with the women trying to justify cutting the excellent maternity services at Honiton with stories of their own difficult childbirth experiences!! Vernon Whitlock (town councillor for Honiton) was a great chairperson and supported the many mothers in the room, most with their own little ones playing at their feet, with their comments and questions about the cutbacks being proposed. 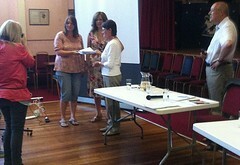 The Save Honiton Maternity Unit group handed in their petition (photo at the top). We collected quite a few sheets of names on our own Green Party Stalls over the past few months, which contributed to the 1500 signatures handed in (with another thousand or two to be handed in at a later date). New MP for Tiverton & Honiton Neil Parish stood up to support the parents asking for these changes to be reconsidered. See Midweek Herald article here. Nick Clegg today vowed to end the tradition that sees mothers do the lion’s share of looking after children by giving fathers the right to far more flexible leave. The Deputy Prime Minister attacked the ‘measly’ two weeks he was given when his third son was born as he gave a major speech on the family. And he insisted the whole premise that mothers will be the main carers should be destroyed in what amounts to a revolution of parents’ rights. A new Childhood and Families Ministerial Task Force will look at the best way to re-balance the family set-up. Honiton town council has called a public meeting on Saturday 15th May at 10.30am, The meeting will be at the Makarness Hall, High Street Honiton. The town council has again invited NHS Devon to attend and are awaiting a response. Anyone who has been collecting signatures for the Honiton Maternity unit petition please could you get them into Honiton town council by midday, Friday 14 May. We can then present them to the NHS and show what local feeling towards the changes at Honiton Maternity unit really are! I’m hoping to make this meeting on Saturday, can anyone else come too? We need people to represent the East Devon Green Party. If we’re hoping to make a breakthrough by getting a Green councillor on the EDCC (East Devon County Council) then we need to be VISIBLE all throughout the year! Please add your comment below if you can come. Thanks. It has been announced this week that the adjoining constituencies of Tiverton and Honiton and East Devon are both to be contested by the Green Party. 40 year old mother of three Cathy Connor of Kentisbeare is standing for Tiverton and Honiton and 37 year old mother of two Sharon Pavey of Membury has already been out and about canvassing in Ottery St Mary, Sidmouth, Budleigh Salterton and Exmouth (the East Devon constituency). Cathy is the 12th Green Party candidate in Devon – making this a record breaking full slate in Devon for the Greens, who are hoping to get their first MP into Parliament this year. 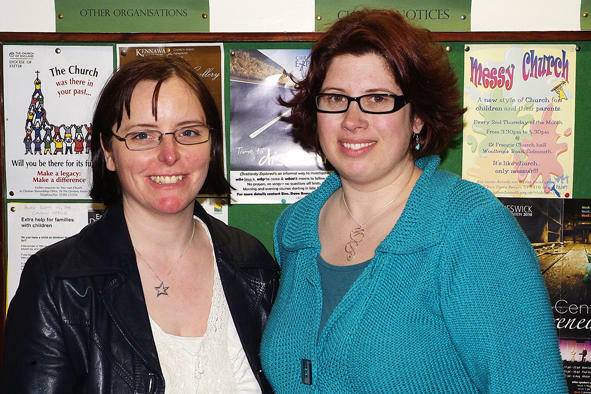 The two women share similar views on many issues which affect parents across Devon. Sharon has been involved with the recent campaign against cuts at Honiton Maternity Unit, attending a protest at the Knowle a couple of weeks ago, “As I have met so many worried parents in Ottery and Sidmouth who are appalled at these cuts, I felt I needed to get involved to try and stop us from losing such a wonderful facility. I myself, needed to spend five days in hospital after my first baby and cannot understand how exactly taking away the option to stay in for a night or two, would give women more choice”. Cathy stayed at Honition Hospital after having all of her three children and found the help and support of the staff and midwives invaluable. Both Cathy and Sharon are very concerned about the environment but are keen to point out that the Green Party has strong polices on a wide range of issues. Sharon says “We want to raise pensions to a decent £170, withdraw our troops from Afghanistan and Iraq, protect our public services and invest in green industry to provide a million much needed jobs.” Cathy adds “Affordable housing must be made available locally so that young families can have a decent place to live without having to travel great distances to work or be separated from friends and family”. You can contact Sharon or Cathy via the East Devon Green Party – Local Party Contact is Diana Neal on eastdevongreens@googlemail.com or 01395 263728. Photo above by Geoff Sharples. Sharon Pavey on the right. Cathy Connor on left. Campaigners fighting to save the full range of maternity services at Honiton Hospital have asked NHS Devon (formerly Devon Primary Care Trust) to clear up confusion about services available at the hospital. A demonstration against cutbacks to Honiton’s maternity post-natal care service is to take place next week at an East Devon town, on Monday (29 March). The event will be held outside East Devon District Council’s offices in Sidmouth and is expected to draw large crowds of local people who are passionately against plans to send mums home from Honiton maternity ward, within a few hours (possibly two hours) of giving birth. You can read more about the protest here on Devon 24. 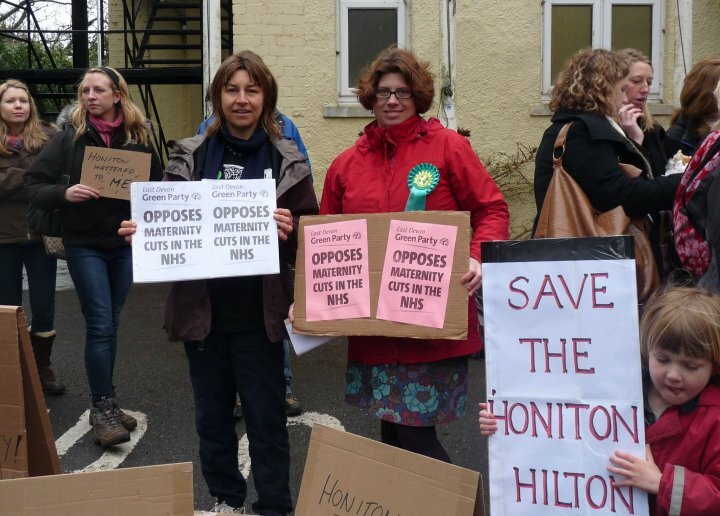 I’ve blogged about the cutbacks at Honiton Maternity Unit previously and I will try and be there on Monday to represent the East Devon Green Party and find out why East Devon MP Hugo Swire is not doing anything about this. Parents from all over the East Devon constituency use the excellent maternity services in Honiton and parents-to-be like Gavin and Jade Watts are very concerned. They have started a Facebook Campaign called SAVE HONITON MATERNITY UNIT ON SITE AFTERCARE and have an astonishing 2,300 members. Women (and men) who take time out of paid work for family or caring responsibilities make an essential contribution to our society, and they should not be penalised for this. All jobs should be arranged, so every worker maintains a decent work-life balance and has time for family, social and community life. Full-time UK employees work the longest average hours in Europe, 43.5 hours as against 38.2 in France, and 39.9 in Germany. The Green Party wants a 35-hour working week, to help improve people’s work/life balance and help to share out work. A non-means-tested citizen’s pension set at 60% of the median national income, currently £170 a week, which would immediately lift pensioners, particularly women, out of poverty. Major improvements in maternity services. A full range of birth options must be available to all women, and all women should be entitled to the care of a single midwife throughout their maternity experience and post-natally. Breastfeeding rates in the UK are currently well below WHO recommendations, with just 42% of babies being breastfed at 6 weeks, 29% at 4 months and just 22% at 6 months of age. Greens would insist on excellent support for all mothers who choose to breastfeed, and significant penalties to ensure they are not harassed when feeding their children in public, similar to the law already in effect in Scotland. Supporting and enhancing Sure Start centres, which help many women and men with parenting. Our proposed citizens’ income scheme would replace the current child benefit, but in the meantime Greens argue for a higher rate of child benefit, to more closely reflect the cost of rearing a child. You can read the entire report – “Fairness, equity and opportunity: Green Party policies of particular concern to women” – here.